Submitted Photo Chautauqua County Executive George Borrello discusses county issues with members of the Citizens’ Advisory Committee at their first meeting. Michael Ferguson of Fredonia chairs the committee. 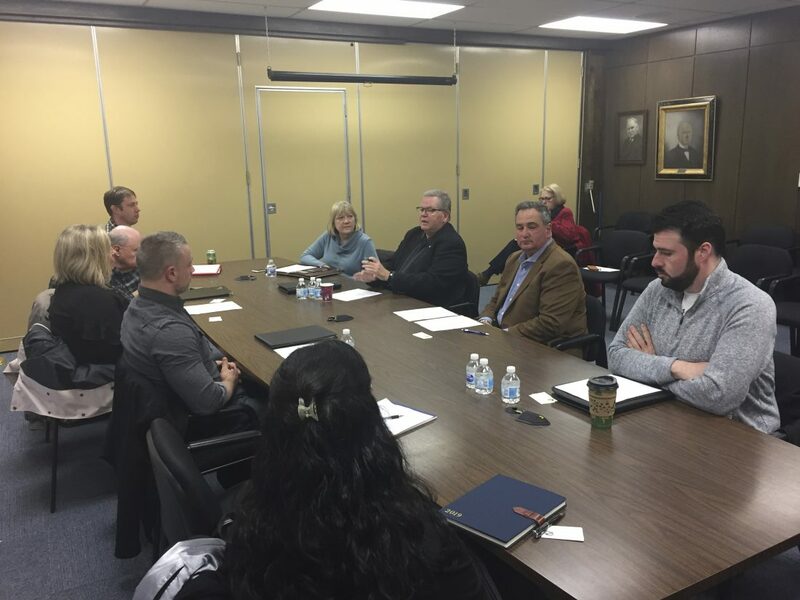 MAYVILLE — Chautauqua County Executive George Borrello is pleased to announce the establishment of a Citizens’ Advisory Committee. The intent is for the committee to be made up of county residents involved in their communities, but not directly involved in local government. By these qualifications they will be able to provide unbiased thoughts and ideas on county services and initiatives. Fredonia resident Michael Ferguson has agreed to chair the committee, and membership appointed jointly by Borrello and Ferguson includes Cindy Aronson of Bemus Point, Michael Bigney of Jamestown, Pam Burmaster of Sheridan, Michael Laurin of Jamestown, William Locke of Dewittville, Gary Peters Jr. of Jamestown, Edwin Rodriguez of Bemus Point, Rebecca Ruiz of Dunkirk, Loretta Torain of Dunkirk, and Matthew West of Cherry Creek. As an advisory committee the group will meet directly with Borrello bimonthly to discuss current issues facing county government. They will also have a direct line of communication with the County Executive’s Office to discuss ideas and issues as they arise between meetings. The initial meeting was recently held where prominent issues were discussed including local control of the sale of recreational marijuana, feelings on Chautauqua Lake including the current public narrative and county’s consensus strategy approach, and thoughts on the CARTS transportation service.